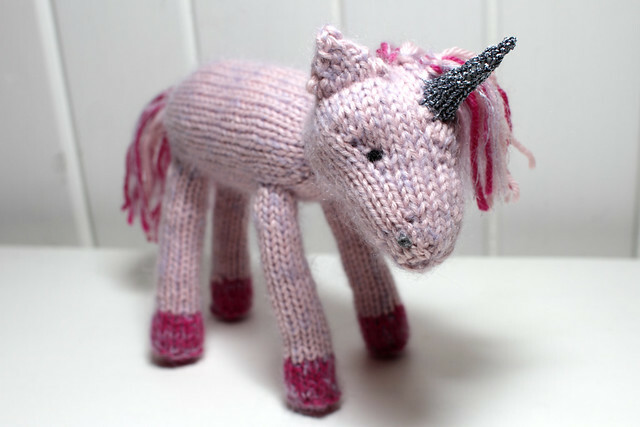 She was created following this pattern: Snow White the Unicorn by Cutie Patooties, which is available for $5. I have previously shied away from making toys out of a dislike for fiddly seaming and work that’s “bitty”. 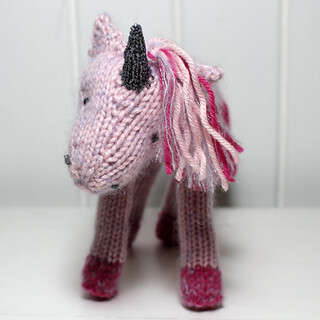 When I was asked if I’d take a commission for a knitted unicorn I decided to meet the challenge and I’m glad to report that this was a pleasure to make. The pattern is thorough, detailed and exceptionally well thought out. The toy has a real personality and it’s all down to getting the right placement and proportion of the features, which the pattern gives great guidance on. I was sceptical about the knitted horn, but even that worked out. I put as much wadding into it as I could, but even so I think that knitting some fine craft wire in with the silver yarn would give the best result. I am least happy with the mane. I followed the instructions and I’m a little disappointed with how visible the knots are. If there’s a knack to this I didn’t figure out what it was – further research required. Overall I am delighted with how it turned out and I will be making more, probably multi-coloured horses a-la My Little Pony.